If you think about it we are all different. God created us all with unique features, personalities, and traits. Give thanks to God because He created you to do great things. You will never accomplish those great things by being the same as the world. Do not do what everyone else does do what God wants you to do. If everyone is living for material things, live for Christ. If everyone else is being rebellious, live in righteousness. If everyone else is in darkness remain in the light because Christians are the light of the world. We were all created uniquely with different talents, features, and personalities. 1. Romans 12:6-8 In his grace, God has given us different gifts for doing certain things well. So if God has given you the ability to prophesy, speak out with as much faith as God has given you. If your gift is serving others, serve them well. If you are a teacher, teach well. If your gift is to encourage others, be encouraging. If it is giving, give generously. If God has given you leadership ability, take the responsibility seriously. And if you have a gift for showing kindness to others, do it gladly. 2. 1 Peter 4:10-11 God has given each of you a gift from his great variety of spiritual gifts. Use them well to serve one another. Do you have the gift of speaking? Then speak as though God himself were speaking through you. Do you have the gift of helping others? Do it with all the strength and energy that God supplies. Then everything you do will bring glory to God through Jesus Christ. All glory and power to him forever and ever! Amen. 3. Romans 8:28 And we know that God causes everything to work together for the good of those who love God and are called according to his purpose for them. For God knew his people in advance, and he chose them to become like his Son, so that his Son would be the firstborn among many brothers and sisters. 4. Ephesians 2:10 For we are God’s masterpiece. He has created us anew in Christ Jesus, so we can do the good things he planned for us long ago. 5. Jeremiah 29:11 For I know the plans I have for you—this is the Lord’s declaration—plans for your welfare, not for disaster, to give you a future and a hope. 6. 1 Peter 2:9 But you are not like that, for you are a chosen people. You are royal priests, a holy nation, God’s very own possession. As a result, you can show others the goodness of God, for he called you out of the darkness into his wonderful light. 7. Psalm 139:13-14 You made all the delicate, inner parts of my body and knit me together in my mother’s womb. Thank you for making me so wonderfully complex! Your workmanship is marvelous—how well I know it. 9. Job 33:4 The Spirit of God has made me, and the breath of the Almighty gives me life. 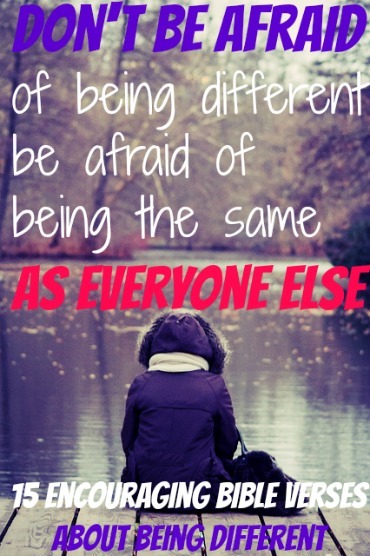 Do not be the same as everyone else in this sinful world. 10. Romans 12:2 Don’t copy the behavior and customs of this world, but let God transform you into a new person by changing the way you think. Then you will learn to know God’s will for you, which is good and pleasing and perfect. 11. Proverbs 1:15 My son, do not walk in the way with them; hold back your foot from their paths. 12. Psalm 1:1 Oh, the joys of those who do not follow the advice of the wicked, or stand around with sinners, or join in with mockers. 13. Proverbs 4:14-15 Do not set foot on the path of the wicked or walk in the way of evildoers. Avoid it, do not travel on it; turn from it and go on your way. 14. Genesis 1:27 So God created human beings in his own image. In the image of God he created them; male and female he created them. 15. Philippians 4:13 I can do all things through him who strengthens me. Previous: Is Black Magic Real?